Many of my quests for allergy-free treats start off with Google searches for vegan recipes. Thankfully, there are many wonderful vegan bakers out there willing to share their knowledge. This recipe is an adaptation of one I found on Allrecipes.com. The original can be found here. I like to make them as mini brownie cupcakes and include my flax 'egg' as well as chocolate chips - both add to the gooey factor. One of the keys to having fudgy brownies is to not over-cook them. My rule of thumb is to remove them from the oven once I can smell them. The longer they are cooked, the more cake-like they will be. Believe me, these go fast! 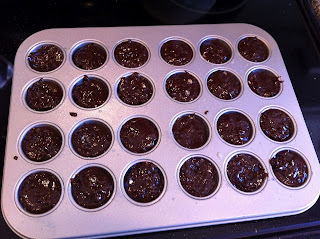 Preheat oven to 350 degrees, prepare mini muffin tin by spraying with a baking spray that has flour. 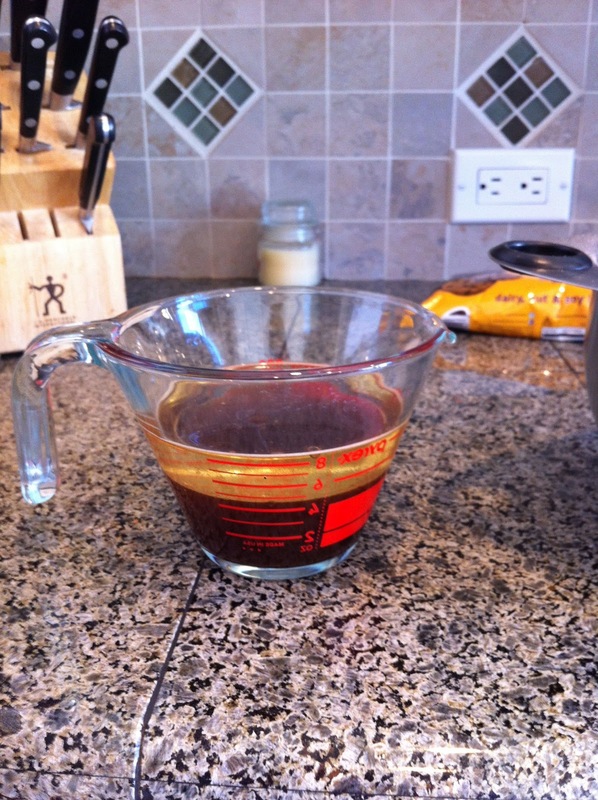 In a liquid measuring cup, measure the coffee and oil. Add vanilla and flax mixture. 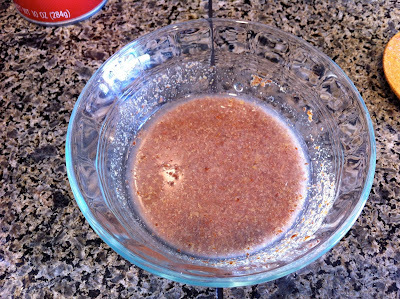 Combine dry and liquid ingredients. Stir in chocolate chips. 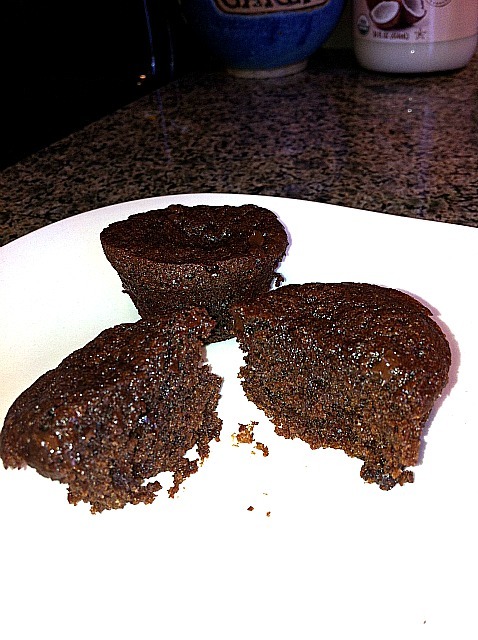 Fill each mini-muffin cup with about 1 rounded tablespoon of batter. Bake for 10-12 minutes. Makes about 24 mini-muffins. 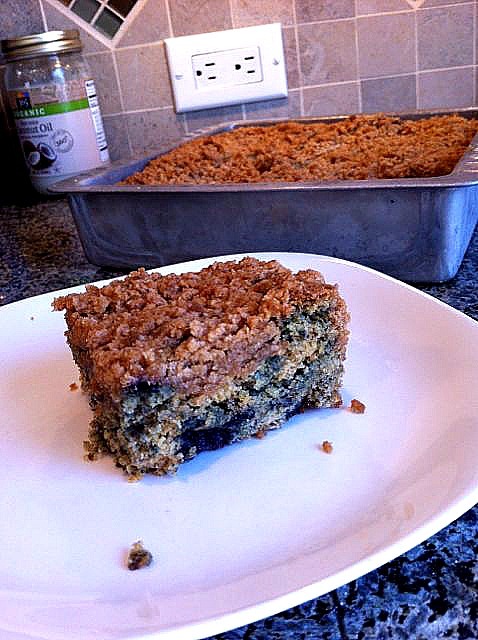 I adapted this recipe from my 'Everyday Food - Great Food Fast' cookbook. It's been a huge hit at our house, even with kids who don't care for squishy fruit in their food. 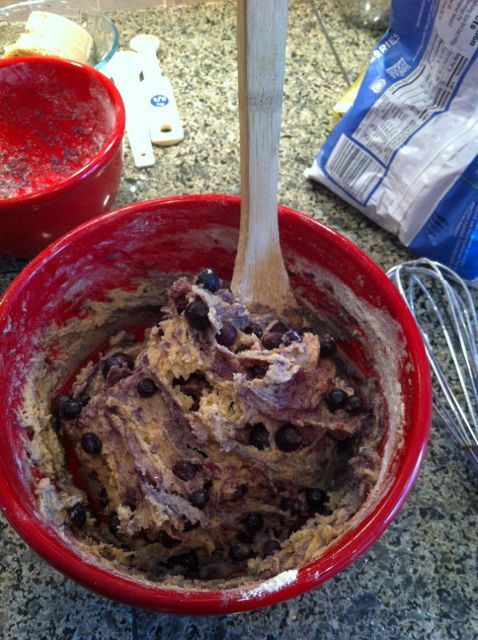 Before adding the blueberries, I tossed them with a little flour so they wouldn't turn the batter into a purple blob once they were folded in. My batter ended up pretty purple, probably due to the fact that I used frozen wild blueberries, which bleed a lot. 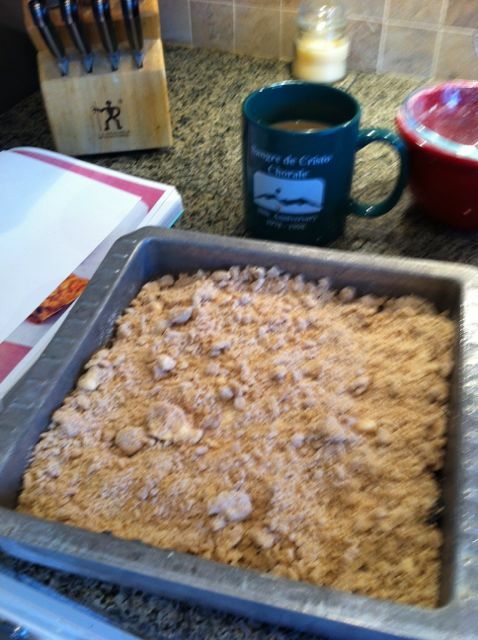 Oh well, a little purple coffee cake never hurt anyone. After baking in a 350 degree oven for 45-50 minutes, it was ready to be gobbled down! My kids have been known to eat the entire pan in 1 day. This recipe could be easily adapted to be gluten-free by using your favorite all-purpose gluten-free flour instead of the whole wheat pastry flour. Preheat oven to 350 degrees; grease and flour an 8x8" pan. 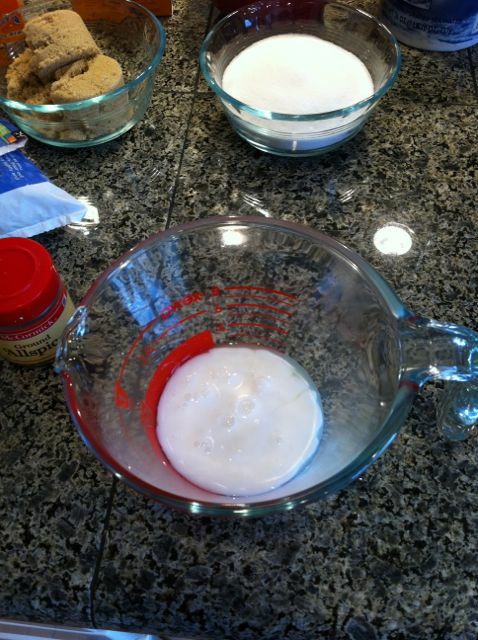 Prepare the 'egg' and 'buttermilk' in two small bowls. 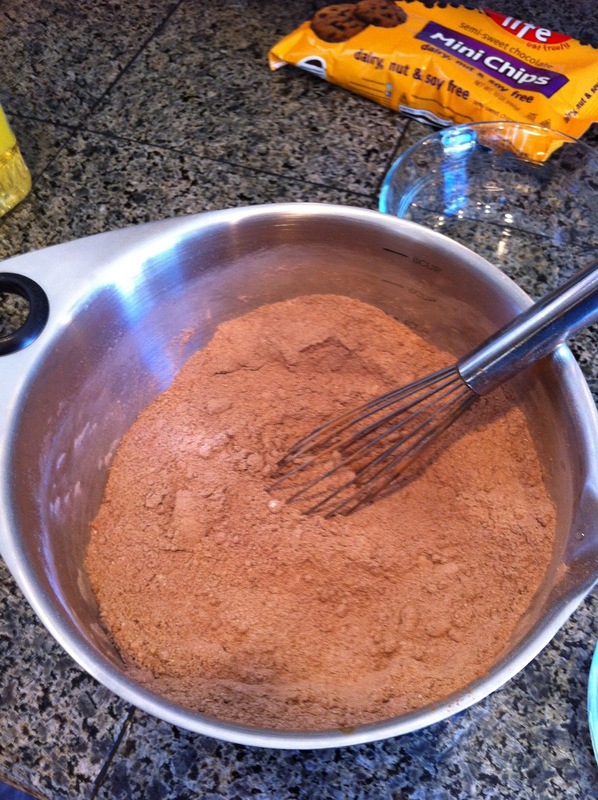 In a medium bowl, whisk together the flour, baking powder, baking soda, salt, and allspice. In another bowl, cream together the margarine and sugar. 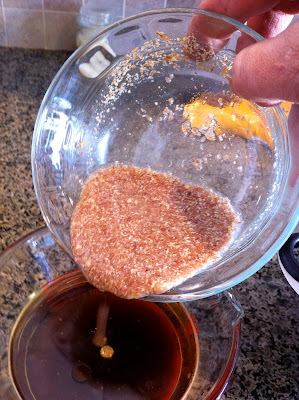 Add the 'egg' and mix until combined. 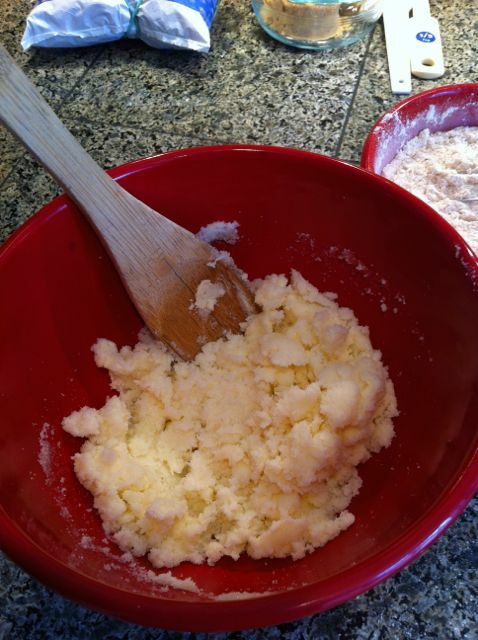 Add the flour mixture and 'buttermilk' in alternating batches, beginning and ending with the flour. Batter will be very stiff. 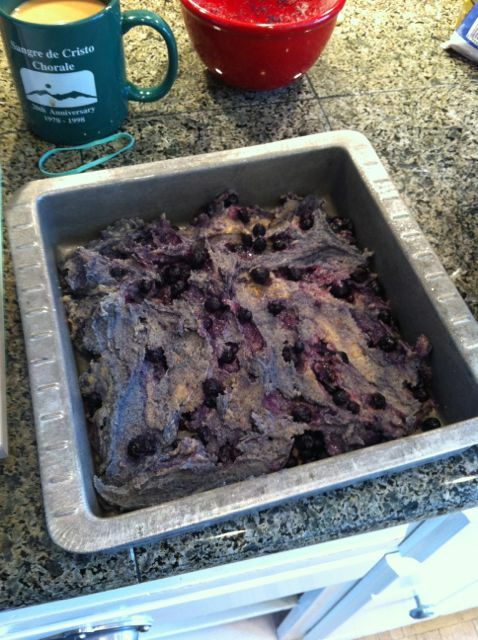 In a small bowl, toss the blueberries with a teaspoon of flour, fold them into the batter, and pour the batter into the prepared pan. Sprinkle evenly with the streusel topping (directions below), covering the batter completely. Do not press in. Bake until golden brown, and a toothpick inserted into the center comes out clean, 45 to 50 minutes. Cool and enjoy! 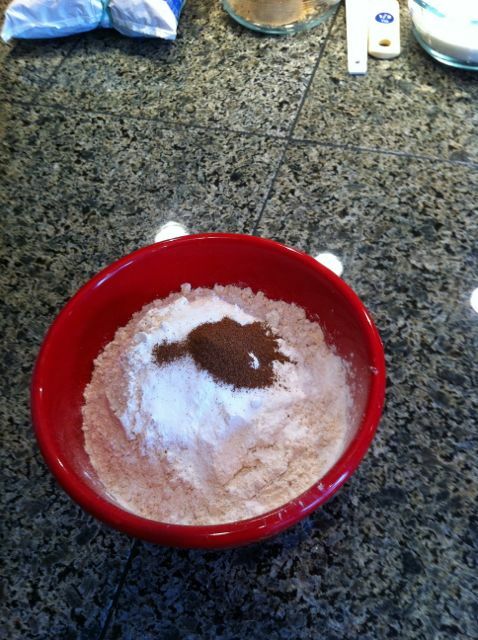 In a medium bowl, mix the flour, sugar, cinnamon, and salt. 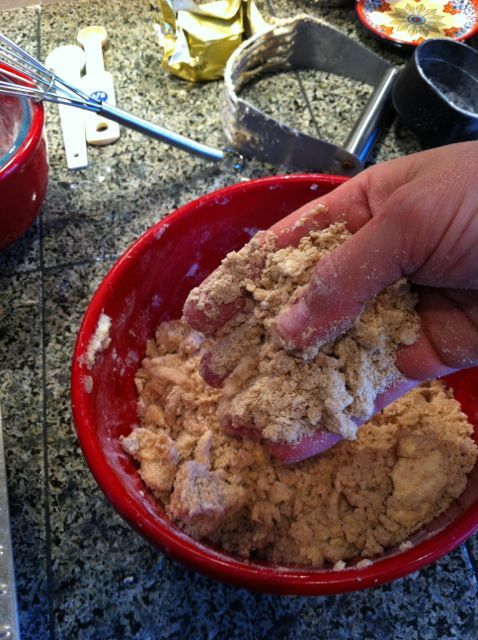 Using your fingers, work in the margarine until large, moist crumbs form. 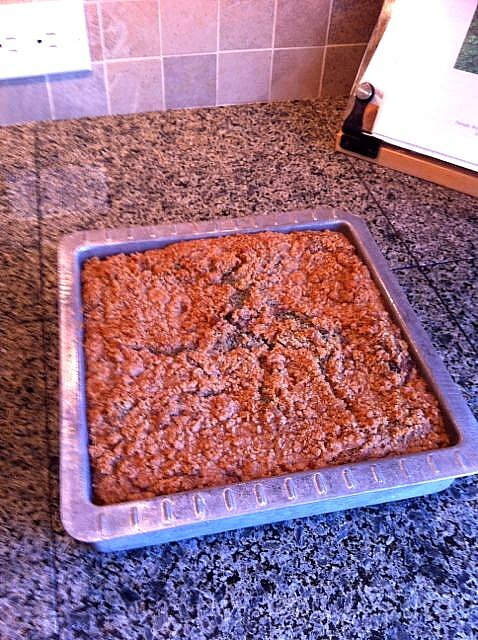 Make sure the crumbs are large so they form a crisp topping as the cake bakes instead of melting into the batter. This verse suddenly became very real to me, as a mom who felt powerless. Eventually, I took refuge in the fact that God created her perfectly, and something good would come out of it. There are several great websites and support groups for parents of children with food allergies. I checked them all out and spent some time perusing the many forums. While it was helpful to know that other parents were facing the same challenges, something about these forums didn't sit well with me. Many of the loving, vigilant parents were letting their child's food allergies take over their life and making it the focus of their family. They were totally removing any food allergens from the house. Don't get me wrong - I understand the need for vigilance, but I don't want to make things bigger than they need to be. 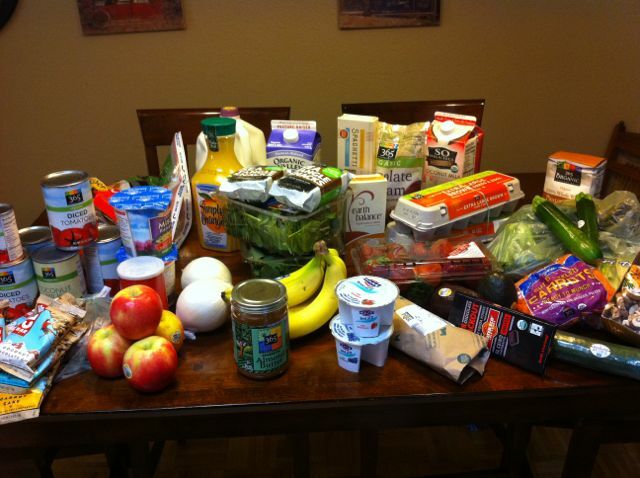 For that reason, I decided to NOT remove dairy, eggs and nuts from our house. The rest of us could eat these items, and I didn't see the need to totally take them out of everyone's diet. Instead, I decided to educate my daughter about what she could and couldn't eat, to read labels, and to always ask questions. In my opinion, this approach will help her function in the real world, where she will constantly be exposed to various food allergens. You can also see some allergy-free items such as Cliff Bars, Miso ramen soup, coconut milk, and Earth Balance margarine. If you are new to all of this, be encouraged - you can do this! 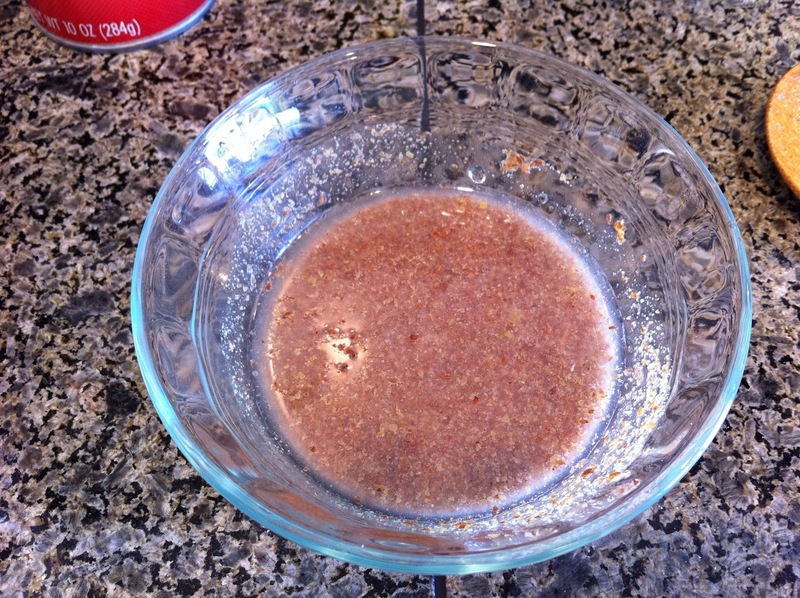 Coconut products: These have been a life (and recipe) saver for me! 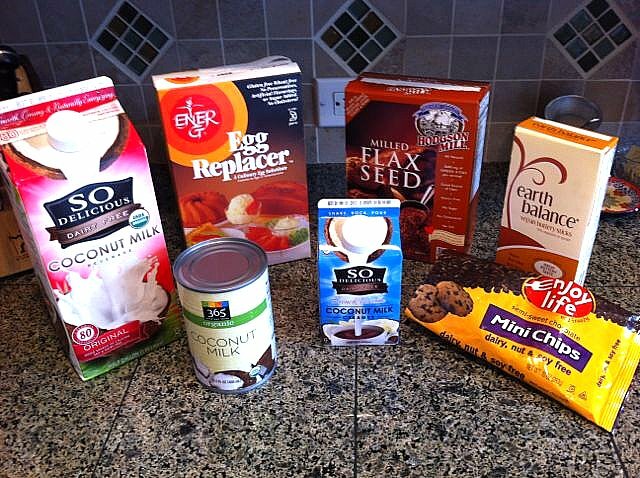 I use the boxed coconut milk and/or the coconut creamer as a substitute for cow milk in my recipes. 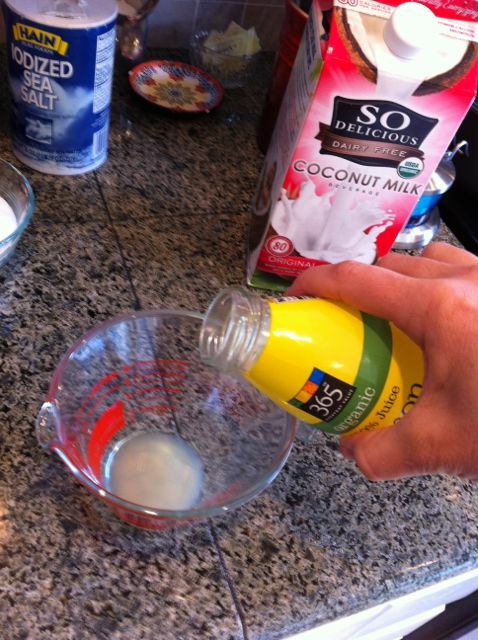 The canned coconut milk is a wonderful substitute for heavy cream. 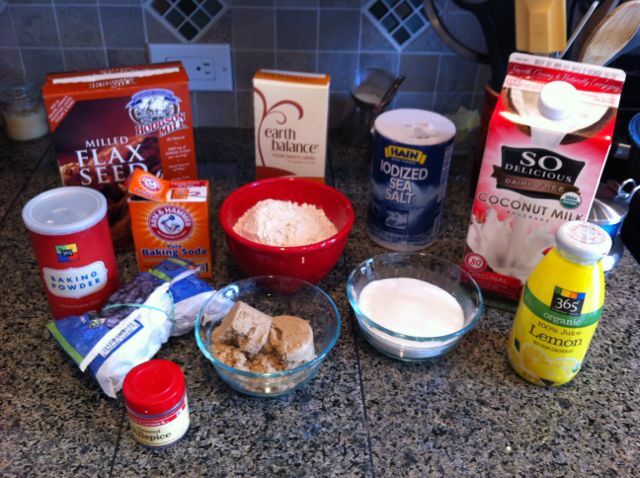 Coconut yogurt (not pictured) is wonderful for baking as well. Earth Balance: These 'Vegan Buttery Sticks' are a great substitute for real butter. Another great butter substitute is Spectrum Organic Shortening . 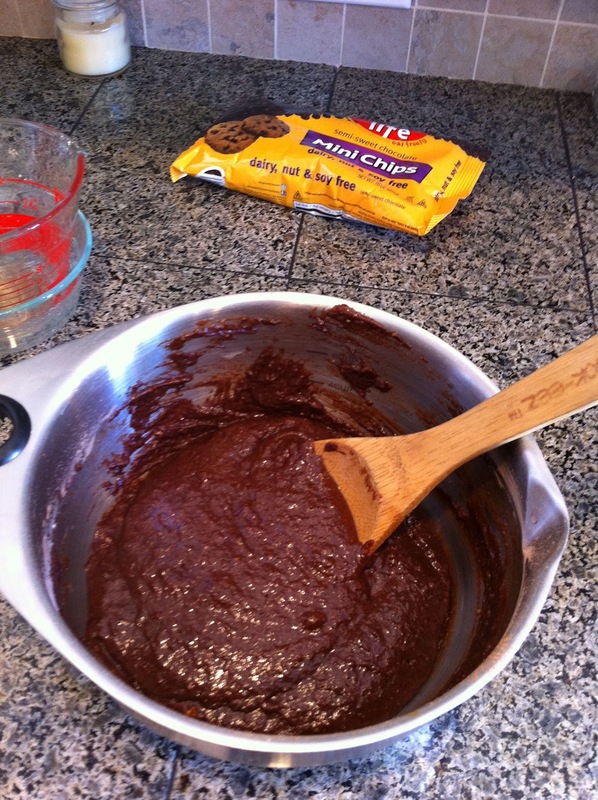 Enjoy Life Chocolate Chips : Great option for chocolate chip cookies. Whole Foods does have their own 365 brand of vegan chips as well. 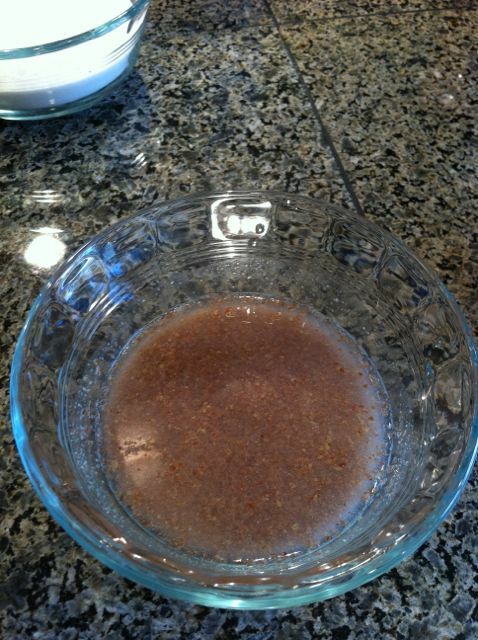 Ground Flax Seed : This is my favorite substitute for eggs (1T ground flax + 3T water) in most recipes because it doesn't change the flavor too much and adds some healthy omega-3 fats. Ener-G Egg Replacer: Another option for egg substitute in some recipes that don't call for too many eggs. 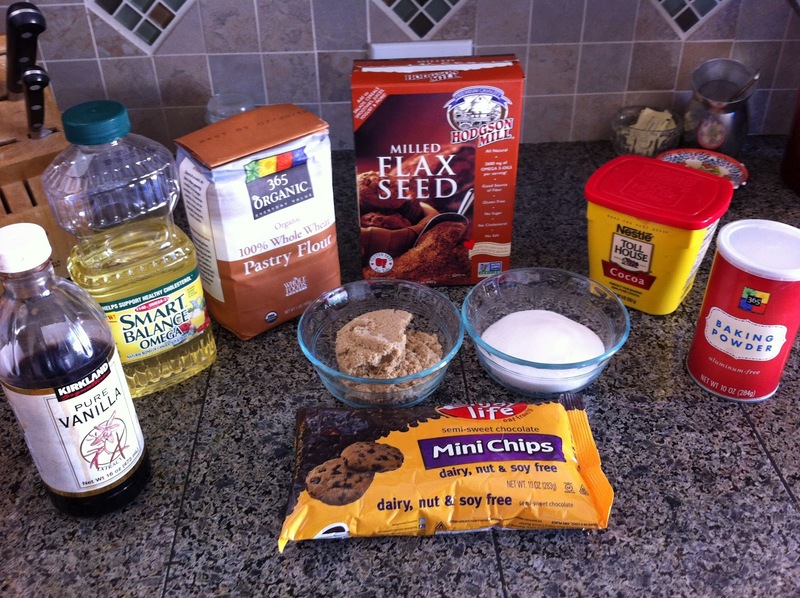 Some people claim this product adds a funny taste to the recipe, so I always try the flax seed option first. Gluten-free ingredients(not pictured): For gluten-free baking, I like to have on hand my 3 favorite GF flours - Superfine brown rice flour, potato starch, and tapioca flour. 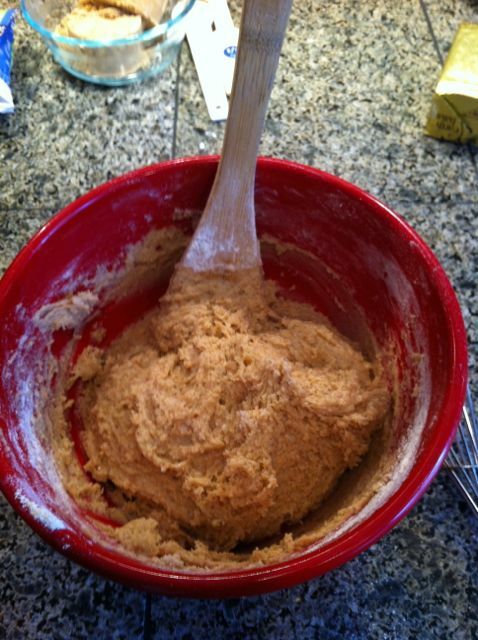 It's also important to have some xanthan gum, which provides structure and elasticity in GF recipes. 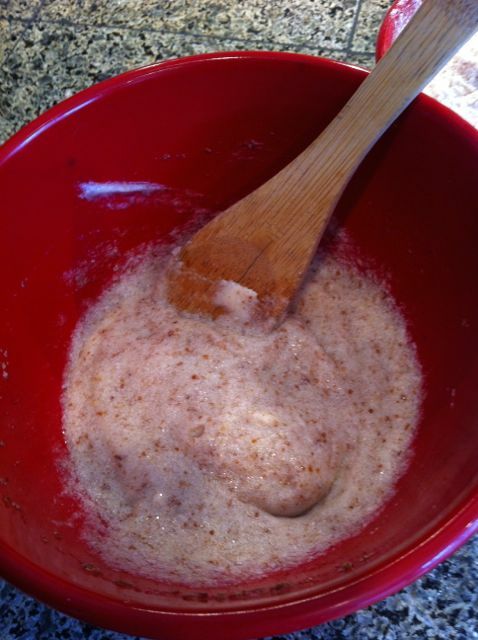 Other handy GF flours include millet flour and sorghum flour, both great for GF breads.